A discussion should be held with the Examinations Department and other relevant parties with reference to installing signal jammers at examination centres, Telecommunication, Digital Infrastructure and Foreign Employment Minister Harin Fernando said yesterday. “The technical difficulties should be reviewed at the discussion,” Minister Fernando also said. Minister Fernando was commenting on the recent claim made by the Examinations Department that a project will be launched to disable mobile phone signals within the examination centers during the G.C.E. Advanced Level examination which is to be held next month. Fernando also said that he is not aware if discussions have already being held with regards to the matter with Sri Lanka Telecom. Pointing out the practical difficulties of installing jammers at each and every examination center island wide, Minister Fernando said that it would not be possible to jam signals from telecommunication towers since it may disturb the communication of the public. “How many examinations centers are there island wide? If we are to do this, we have to install jammers at all these locations. At how many areas should we do this signal jamming? This seems rather impractical,” Minister Fernando said. “If we jam the signals from telecommunication towers, it will affect everyone in those areas. It will definitely have a negative impact on business interactions and similar other communications. Therefore, it does not seem practical either,” Minister Fernando pointed out. The Minister said a discussion should be held if they are to proceed with this idea. 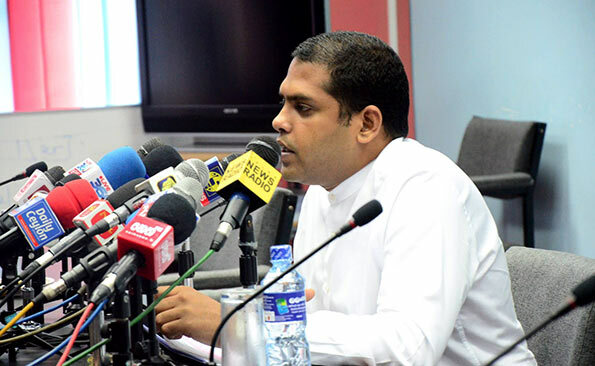 Minister Fernando was speaking at a press brief at the UNP Headquarters, Sirikotha yesterday morning.